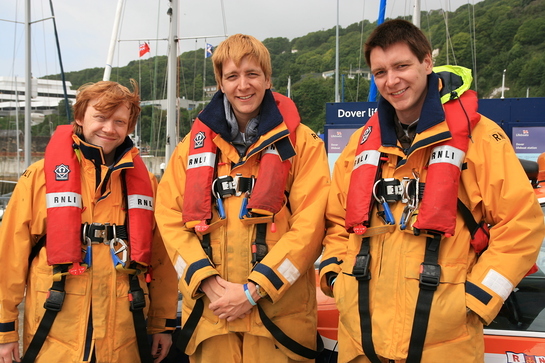 Harry Potter stars Rupert Grint, and brothers Oliver and James Phelps are rallying support for the Royal National Lifeboat Institution (RNLI) by taking part in the Barmy to Barcelona Wacky Rally this weekend. 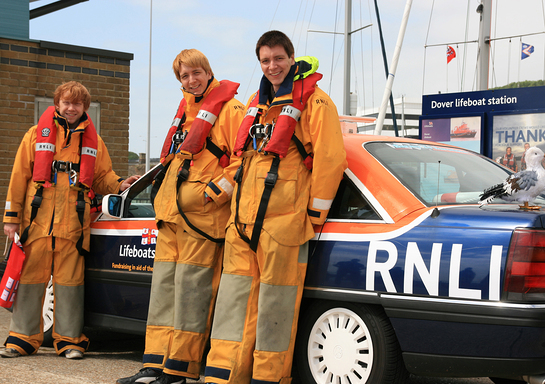 Rupert, Oliver and James have really pushed the boat out with their 1992 Vauxhall Carlton rally car, decking it out in the familiar livery of an RNLI all-weather lifeboat. Continuing with their maritime theme, the trio have entered the race as The Salty Sea Dogs and aim to raise awareness and funds for the charity that saves lives at sea. Taking in the amazing Swiss Alps, rolling hills of Italy, French Riviera and the Spanish Catalan capital, The Salty Sea Dogs are hoping to propel their way to a competitive time in their first wacky rally. Oliver and brother James have supported the RNLI previously by taking part in the charity’s national fundraising day, SOS Day, which takes place annually on the last Friday in January. In 2009, RNLI lifeboats rescued 8,235 people and RNLI lifeguards aided 15,957 people. To support the Weasleys, click here.